I finished Star Wars: Legacy of the Force: Invincible last night, and for most of today I haven’t been able to think about it. I don’t yet know whether my reaction to the book surprised me or not – I’m a huge SWs fan, and I avidly read everything I can get my hands on that come from Lucas Books, so my liking for a galaxy far, far away might be biased, but then again, isn’t every fan? – so I’m doing this review as a way of trying to sort out my feelings about the end of the Legacy of the Force series. First off, in my opinion, Invincible was not an adequate end to the series. When I bought the hardcover of Betrayal by Aaron Allston while I was in Australia visiting my parents, I was immediately and irrevocably hooked. This was promising to be even larger and more important than the New Jedi Order books, I the cliff-hanger-ending blew me away. As the books progressed, I began to get the feeling that some of the more minor plot points running through the series were being forgotten – because they began as major plot points and then kind of fizzled out. Case in point, the civil war between the Galactic Alliance and the Confederacy; by the time Fury came and went, I knew that this civil war – civil war – had somehow taken backstage to the larger and more pressing events in the series, which I can totally understand; what is a civil war against the murders of both Mara Jade Skywalker and Jacen Solo / Darth Caedus? What could possibly be more important than the return of Boba Fett, having the Jedi hide themselves to survive, and having the galaxy return to a time of suspicion and iron control? I just didn’t think that the war ended properly – you would think that with Corellia’s independent streak, they might have decided, “You know what? Bugger you all, we’re staying independent!” But to just meekly sign an agreement with the new Galactic Alliance Chief of State (whom I will be discussing later) smacked of Troy Denning (or Sue Rostoni) thinking, I just don’t have time for this, let’s just end it. That said, I can understand that. 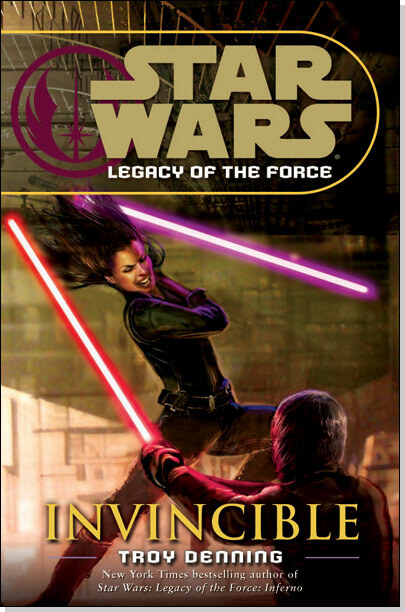 Troy said that Invincible was a book focused exclusively on Jaina Solo and Jacen Solo / Darth Caedus; to pretend anything else would have completely wrecked the book. This book was about the Sword of the Jedi finally being forced to acknowledge the role she must take and the final fate of her twin brother. And that, my friends, is where this book is achingly, extremely kickass. J Everyone’s reactions, thoughts, decisions and points of view made sense. When Caedus simply stands and lets his sister murder him (and lets not call apples oranges here, guys, that’s what Jaina did) and he is sending out a Force-scream trying to warn his ex-lover about a nanovirus attack, that is the Jacen Solo we got to know and love since his birth in the Thrawn era. That’s the Jacen Solo that was unmarked by the Yuuzhan Vong, or Vergere, or even the training accident where he cut off Tenel-Ka’s arm. Jacen forced Caedus into the background and took his place – in my opinion, Caedus redeemed himself, more completely than any dark sider returning to the light ever could or has. To stand against someone, knowing that you are going to die, and thinking of those you love and care for… that’s not a Sith reaction, my friends. Jacen Solo came back for a split second, and died. Now, why do I say that Jaina murdered her brother? Well, Caedus turned everyone against him, following the path he had chosen, not regretting, and looking back only when he was analyzing his mistakes. Caedus knew what he was doing, and why he was doing it. But at the climax of the final duel, Caedus retreated – the shadowy force vision that spoke to Lumiya in Betrayal had accomplished what it needed to, and Jacen came to the fore again. But as Caedus, all that Jacen accomplished that will stay with his family and those who knew the full extent of his fall will be the fact that he caused everyone to mistrust, hate and pity him. How could Jaina be expected to trust a Sith? Jaina sure isn’t Anakin Skywalker, but her strength is also the one thing that will haunt her for the rest of her life. This book was an utter and complete roller-coaster ride for me; the battles were epic and incredible, the duels pure Star Wars, in short, it was a great book. Except for the fact that the series should have perhaps run a bit longer – so as to give Jacen a bit more oomph as a Sith and make the civil war seem to make more sense – but all in all, a great book!